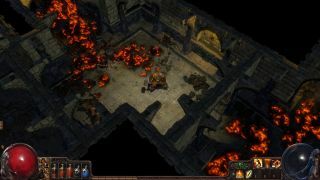 If you haven't been keeping track of it, Path of Exile is an indie, top-down, loot-based RPG looking to fill the niche a vocal portion of the community feels is unserved by the cartoonishness of Torchlight and the host of oft-maligned changes to the Diablo franchise between its second and third installments. Developer Grinding Gear Games announced on its forums that the open beta should be going live right around the time this article is posted. Check out the trailer above to get a sense of the brooding moodiness. Players from the closed beta will have their items removed, and their existing characters reverted to level 1. This will, however, be "the final wipe the game will ever have." So your characters from open beta will remain untouched into release. While you wait on the servers, GGG has also provided this beginner's guide to get you started when you are able to log in.